In astrology, a planet is said to be retrograde when it apparently reverses its usual counter-clockwise direction and moves backwards. This is what can be observed if one gazes into the sky through a telescope placed on our planet Earth. All planets seem to retrograde at some point of their cycle, except the Sun and the Moon, who are not planets but luminaries. Outer planets are in the retrograde mode roughly 40% of the time, more than inner planets. Mercury is retrograde approximately during three weeks every four months and Venus, during approximately forty-two days every twenty months. In fact, planets do not move backwards. Retrogradation is a visual, yet normal phenomenon, which is part of the planet's cycle as it orbits the Sun. Retrogradation is caused by the difference of speed between a given planet and the Earth. It can be observed from the Earth when the said planet slows down to the extent that its speed is slower than the Earth's. We do not want to get you lost in complex astronomical details since our website is astrology-oriented. We kindly advise those among our valued readers who are interested in astrophysics to visit one of the good existing astronomy websites displaying animated graphics in order to visualise and understand the retrogradation mechanism. As far as we are concerned, we invite you to imagine that you are travelling in a train. As you look through the window, you can see that the train is moving forward. Then, another train running in the same direction, but at higher speed, overtakes your train. For a couple of seconds, you have the impression that you are moving backwards although it is not true at all. In a nutshell, this is what is happening when, viewed from the Earth, a planet is apparently in the retrograde motion, i.e. clockwise. 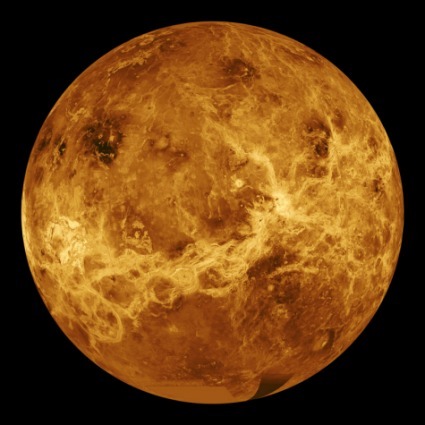 In this column, we address Venus' 2009 retrogradation. You may read on basic astrology websites, or in your favourite magazine, that Venus will be retrograde from 6 March to 17 April. Although it is technically correct, we wish to draw your attention to the fact that, as important as it is, the retrograde motion is only one phase of the whole phenomenon, and that the phases called "shadow zones" must be reckoned with, if you are to get a good grasp of retrogradations and to interpret them properly. For this purpose, we deem it helpful to delineate the different stages of the phenomenon and to provide you with the dates of its main phases. Please bear in mind that the days below should be read as a sort of climax point, and that their influences may start a couple of days before and after the reference point. On 2 February, Venus transits Pisces at 29° in direct motion. This is the beginning of the pre-shadow zone, which extends to 15°26' Aries. 17 April, around 7:30 p.m., when she reaches 29°12' Pisces. She stands still once more (her "station direct") and turns into direct motion. Note that this is the degree which she transited on 2 February. This is the beginning of the post-shadow zone. On 21 May, Venus crosses 15°26' Aries again, the place where she stationed retrograde on 6 March. This time, she is in her usual direct motion. This transit marks the end of the post-shadow zone and the completion of the retrogradation cycle. During this particular period of Venus' cycle, everything the planet stands for tends to play out inwardly and affect psychological states. Therefore, expect matters related to the five senses, financial and material possessions, love, fertility in the literal and figurative senses, harmony and justice, aesthetics, relationships, and negotiations to be at the core of your thoughts. You may not enjoy socialising as much as usual. You prefer to withdraw in some kind of retreat and concentrate on in-depth introspective work in order to discover the real meaning of your daily interpersonal exchanges. The other possibilities are that you are blessed with extraordinary inspiration, or on the contrary, you feel that your creativity is totally drained, strangely enough. In any case, after the cycle is completed, more often than not, you realise that the principle of evolution inherent to Venus retrogradations has worked. You are empowered and you find it easier to influence your world. 4. Who Is Concerned and How? people having natal Venus as part of their planetary dominant. People with sensitive points at 29°Taurus, Cancer, Scorpio, Capricorn, or between 0°-15° Gemini, Leo, Sagittarius, and Aquarius, are very favoured. However, since they receive only soft aspects from Venus, there are not enough tension and stress to prompt them to take action. As a consequence, they may miss good opportunities for personal growth. For all other people, the retrogradation will go more or less unnoticed. Please note that we are analysing exclusively the transits of Venus. Transits by other planets occurring within the timeframe indicated above may bring about concrete events and/or psychological developments which do not fit our description. Since Venus is mighty in Pisces, the sign of her exaltation, she is unlikely to wreak havoc in the affairs of the houses that her retrogradation activates. Nevertheless, her station direct at 29° Pisces, an anaretic degree (the 29th degree of all signs) often deemed to be crisis-oriented, warns that indecisiveness may be an issue. To offset possible setbacks, it is advisable to keep all your lines of communication open, to tap into your analytical skills, and to avoid fuzzy situations. You must also pay high attention to details and concentrate on the matters ruled by the houses involved. In Aries, Venus is in the sign of her detriment, and according to the Tradition, she is inefficient since she is unable to express her qualities. Modern astrologers disagree with this ancient interpretation and argue that the powers of Venus in Aries are nothing close to weak since they take on the fiery, pioneering, swift, and impulsive nature of the sign. Suffice it to say that Arian energies counterbalance the possible laziness of Venus and, provided that you accept to exercise some patience and thoughtfulness, you can fare successfully throughout Venus' retrogradation cycle. Do not hesitate to exploit the tools Venus is lending you. Charm, softness, love, financial matters, on the one hand, and relationships, partnerships, harmony, fairness, legal affairs, on the other hand, are the trump cards you should take full advantage of. Indeed, they may open the path to entirely new opportunities. Numerous astrologers have observed that people having Venus retrograde in the natal chart feel more comfortable during the planet's whole retrogradation cycle. Whereas people with a natal direct Venus may undergo difficulties in the fields ruled by Venus (see above), people with a natal Venus retrograde are very likely to fare much better and to benefit more from the period. In 2001, Venus' retrogradation involved a segment of the Zodiac which is quite the same as in 2009. To get a more precise idea of what the 2009 retrogradation may bring about, try to recall the important events which occurred between early February and late May 2001. You are most likely to experience a similar type of events, though in a quite different context. For detailed technical explanations on Astrology: Astrological Aspects, Planetary Dominants in Astrology, The 12 Astrological Houses etc., please refer to our relevant column, at the left bottom of our homepage.